Imagine a "pin" gets repinned on Pinterest over 2000 times. What do you imagine that pin to be? Some awesome home decor item? A cover-release from Stephenie Meyer? An awe-inspiring tattoo from renowned tattoo artist so-and-so? (I really need to research stuff better before starting a post). Words of inspiration from Oprah? WELL--I happen to have a pin on Pinterest that, as of right now, has been repinned 2,085 times. This amount seems absurd to me, especially given the fact that I am not an active Pinterest user, nor do I have bazillons of followers (unless 217 counts as a bazillion). But this pin gets repinned so many times on a daily basis that I actually had to turn off my real-time Pinterest notifications. Curious what it is? (Okay, you're not, because you've already seen the picture below, but pretend you can't see it and you're feeling all intrigued). Interesting, huh? Out of all the things that could ignite Pinterest-peeps' interest, for some reason THIS is the magical pin. And even I'll admit that this steampunk pistol looks pretty awesome. But, guys, this IS NOT A REAL GUN. 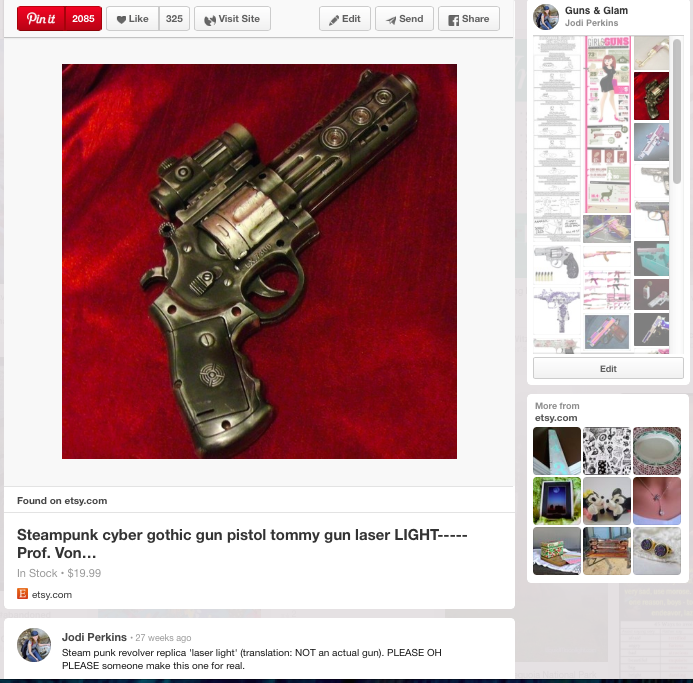 I even made sure to clearly state so in my description--it's a laser light made to look like a gun. But people are re-pinning this thing left and right, plastering it all over their "Cool Firearms" wall, or "My Next Gun," or "Stuff I Can't Live Without," or whatever. Are they not paying attention to the description, or do they just not care? Either way, I told myself if this pin worked its way to 2000 re-pins, I'd post it on my blog. Perfect timing too, because I'm still swamped with work and have no time to write anything meaningful. You can view the actual pin here. Feel free to repin it yourself...and then you, too, can watch this sucker get repinned to high heaven. Whoa, that's a laser?!! Omg! That is a massively cool looking gun though. I don't like guns, but a character in my head might. :) But yeah, 2000 and counting...that's crazy. Where did you find that? That thing looks wicked! It says it is "in stock"...I kinda want to buy it. It'd be one helluva cat's toy. I totally pinned the "Magical Pin"! I put it in my steampunk board. Too bad it's not real, that would be awesome. Could you imagine someone breaking into your place and having that gun pulled on them? Ha! I remember seeing your steam punk board before--it's pretty awesome.